We hear of terms such as precision medicine and multidisciplinary teams for COPD patients but what does that actually mean for a patient? In this article, I will attempt to unravel some terminology and try to explain what it all means and how effective this approach can be. Imagine a world where every patient received targeted care for their particular disease. A management strategy tailor made to treat every symptom of a patient’s disease. While there is a way to go before every patient receives this type of management for their disease, we have arrived at a point where this approach is considered best practice – now it needs to be accepted and implemented by all. The fact is we may never reach the point where every patient receives this level of care, as many healthcare systems are already experiencing huge budgetary constraints. So how does the medical profession reach the millions of COPD patients around the world in a meaningful way? This is the challenge, but one I believe is achievable. But first, what does this model look like? The diagram below is an example of what a multidisciplinary team can look like. The team is designed to manage all aspects of a COPD patient’s disease. A multi- pronged approach to treating patients will amount to better outcomes. A patient’s team can differ, as a lot will depend on the comorbidities particular patients will be dealing with. Like any medical team looking at improving patient outcomes it is important for the patient to engage with their team and provide details of symptoms they are experiencing. While I am a fan of the multidisciplinary team approach, my concern is whether some patients would become too reliant on their team to manage their disease. Granted while some patients will absolutely need this approach, others may believe their health outcome is completely in the hands of their team. So, what is missing in this picture? Patient interaction. When I say interaction, I mean an onus on the patient to embrace and be proactive with their team. 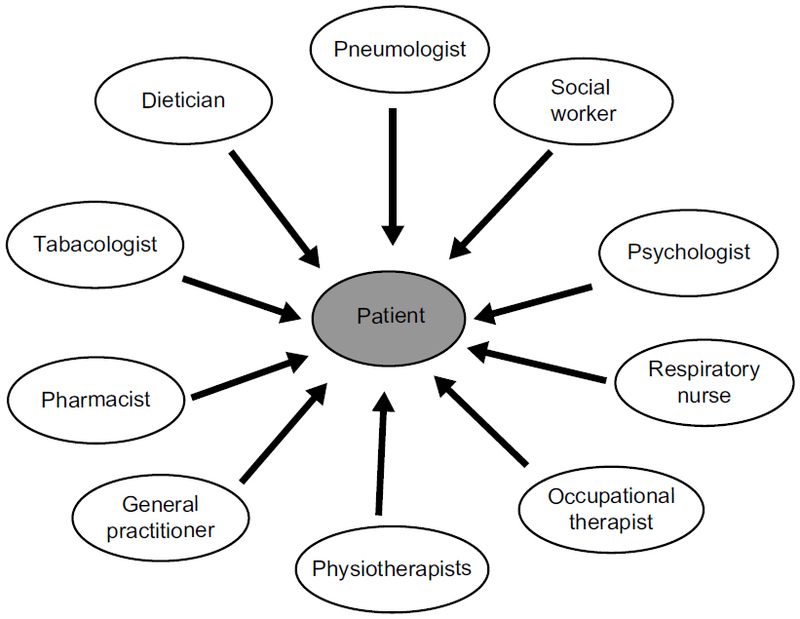 All the arrows in this diagram point to the patient, but none point from the patient to the specialist. If you want a patient to engage with their team you have to give them some responsibilities. This could be achieved by the multidisciplinary team in the form of feedback from patients. Feedback in a written form rather than a verbal response in my experience is more meaningful, as written responses often trigger well thought out answers. The feedback is then shared around the patient’s team and used as part of the treatment plan. The head of the team could be responsible for compliance. Educating patients in the expertise of each team member is also an important part of how the team might work. A patient should know when they visit their pharmacist this person not only dispenses medication but can give instructions on the correct techniques of its use, especially in regard to inhaled medication. Most importantly the specialist involved in the team should believe that each member of the team has an important role to play. If there is a lack of understanding on how each discipline plays a role in a patient’s management then the team falls apart and the patient is the one who suffers. This will always be a challenge due to a number of reasons, remote locations of patients being near the top of the list. While we may not reach everyone, we can reach the majority. To do this our healthcare professionals need to be united in their belief the multidisciplinary team approach is the best model. Once this is widely accepted it then has to be implemented. This is where patients living in remote areas can be disadvantaged, however telemedicine may be a way to help address this problem. National lung organisations may well play a pivotal part in connecting with patients and promoting the multidisciplinary team approach. My feeling is for this approach to become the standard it will have to come from a patient’s respiratory doctor or general practitioner. When we consider there are still some doctors practicing one dimensional medicine, i.e. – here’s your inhalers come and see me in 6 months – we are still a long way from reaching best practice. If we start with some of the basic principles I have written about previously in my article on the Four Pillars of COPD Wellness, we can make the transition to a multidisciplinary team approach more engaging for patients. Knowledge, medication, nutrition and exercise. It’s hard to argue a patient who embraces these principals will not have an improved health outcome. Having patients learn these principals will ensure the multidisciplinary team approach will be more effective for healthcare professionals and patients outcomes.